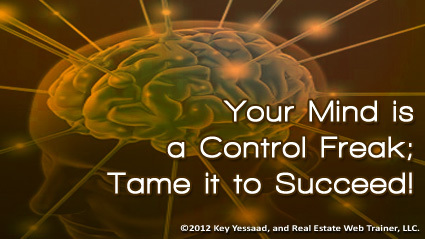 Your Mind is a Control Freak - Tame it to Succeed! Did you know that your mind is a control freak? And did you know that when it over-controls everything it starts trying to store everything and competes with your Smartphone tools, calendar events, task lists, business plan strategies, etc… The only way you can tame your mind so it can stop trying to store information and start ‘thinking’ with you on solutions is to have a task management system that is trustworthy, and reliable. The steps to getting there are simple but require discipline – let’s look at few: 1. Go to sleep early and wake up early, say 10pm to bed 5:30am rise and shine; 2. Spend 20 minutes every morning on your task lists and calendar of events, around 7am is the best time; 3. Stop trying to remember when you are going to do something and place it in the calendar; meetings with blocked time, and tasks in your to-do manager list. 4. Make sure your Smartphone, tablet, and computer are all synching on the Cloud (Think Gmail.) If you do this for 6 to 10 weeks, and stick to it so it becomes a habit, you will gain a best friend – your mind; you will be able to use it to think clearly, stratigize to gain a better edge on your competition, and all around have a good quality of life driven by purpose and intention!